Jacob and Kelsey held their classically beautiful wedding at First United Methodist Church in Lawrence, KS. We did things a little different as far as wedding coverages go. They booked me for about 5 hours of coverage during the day with a second photographer and I came back later for sunset photos of the two of them. We started with a first look with her father and then a first look with her groom. We were able to get all the formal wedding party and family photos done before the ceremony as well because of the first looks. It made things run very smoothly and allowed for the wedding party to walk to Maceli’s and take more fun photos along the way. They held their events earlier in the day and the reception ended about 2 hours before sunset. I came back at the very end of the reception for their grand exit with loads of glitter her wedding party surprised them with. Then we ran around KU’s campus to get photos of the two of them during sunset since sunset during the summer is so much later in the day. 🙂 It was a freaking blast to run around with them after they’ve been having the time of their lives all day 🙂 Plus I mean aren’t they just adorable? 🙂 Adore these two! I love laughing goofy wedding photos. I mean who doesn’t want that?! 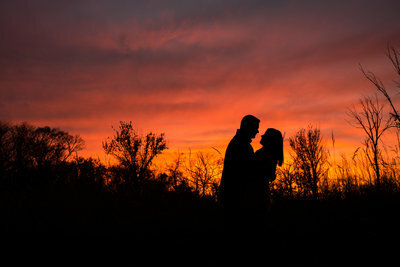 How amazing is this wedding photo with that Kansas sunset? If you love these photos and want to talk about your wedding day. Send over a message and a good GIF here.